I prepared my cards for tomorrow night -- so excited about this Lots of Lavender set! I've stamped the flowers in many colors, but the yellow ink is new! Isn't it so cheery?! Now, how about the luscious ribbon?! I just adore how the crinkled seam binding ribbon ties!! It comes in 4 colors and I own all of them!! 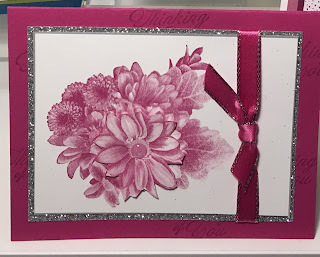 I made a few cards for a friend this week using the fabulous Painted with Love Specialty Designer Paper. The paper practically can stand alone as a card as it's SO beautiful!! Still, I had fun designing these cards!! Isn't the paper so pretty?! Which one is your favorite?! This card is almost completely Berry Burst. The cardstock base is Berry Burst, the banner is Berry Burst ink, and I even embossed the heart/sentiment with Berry Burst ink. Did you know you could do that with our foam stamps? The ink stays wet for a while, giving you a chance to sprinkle some clear embossing powder on the stamped sentiment/image and then heat embossing it. I cut the gold large gold heart out with the Big Shot and one of the Sweet and Sassy heart framelits. There are a couple of other gold elements on the card (the heart sentiment outline, the small gold heart up top, and the gold "blotch" under the banner) which are all from the Painted Love Gold Vinyl Stickers. Card number 2 features another pattern in this beautiful designer paper. It's difficult to appreciate the brilliant gold stripes of this paper but they're there!! I put a little accent of Fabulous Foil Designer Acetate (one side is gold, the other side is silver!) that I cut out with an oval framelit. 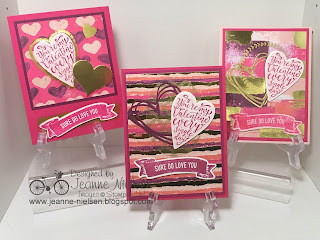 Again, I stamped and embossed the sentiment in Berry Burst ink after I stamped a solid heart in Pink Pirouette ink (oops ... did that with the first card too!). For a different look, I cut out a different heart using the Sunshine Wishes heart framelit included in the set. Again, the banner is stamped in Berry Burst ink using the Sure Do Love You stamp set. I used a Rich Razzleberry mat (4" x 5 1/4") under the striped designer paper (3 3/4" x 5"). The card base is 4 1/4" x 11", scored at 5 1/2". Card number three is similar in layout to the 2nd card. This time, I stamped the banner in Melon Mambo ink onto a scrap of Pink Pirouette cardstock. 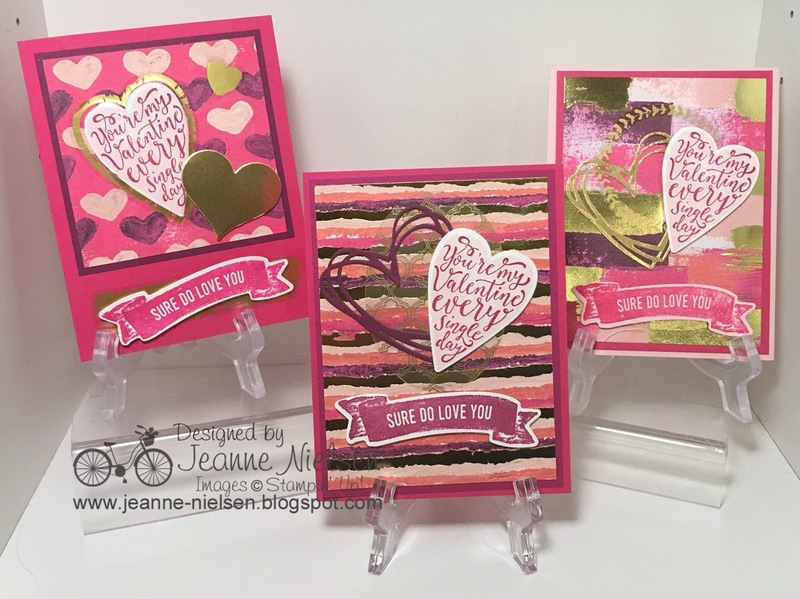 The sentiment heart was done the same way as the first two cards, embossed in Berry Burst with clear embossing powder after stamping the solid heart in the stamp set first with Pink Pirouette ink. Again, I cut out the heart using the Sunshine Wishes framelit, this time in gold foil. I placed a round outline Gold Vinyl sticker under these hearts first, again using a 3rd beautiful pattern from the Painted with Love designer paper. The gold just makes you feel special, doesn't it? The card base of this card is 5 1/2" x 8 1/2", scored at 4 1/4" and is Pink Pirouette card stock. I'm pretty sure the mat is Berry Burst cardstock, but the Melon Mambo cardstock would work just as well I think! That's it for today!! I have to go package some treats for my husband and son -- I met Lyndsey for dinner in Boston earlier this week to give her a special card and treat!! 145562 Sweet Soiree Cardstock Pack (8 sheets each of cardstock: Berry Burst, Marina Mist, Old Olive c/s -- $8.00). Free Sale-a-bration Item: Heartfelt Blooms stamp set (clear -- available only with a $50 minimum purchase until March 31st, 2018.